We are the prominent manufacturer, supplier, exporter and installer of solar panels. To meet electricity needs these days is quite difficult these days as there is fear of those dangerous bills so the best, reliable option is to GO SOLAR and join the mission BIJLI BACHAO!! And install solar panels for electricity which are all suitable for home and business appliances. 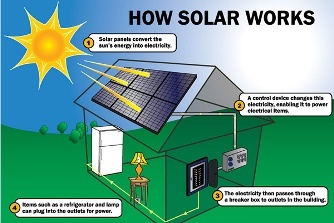 All your electrical appliances such as fridge, tube lights, fans, air conditioner etc can be worked by solar energy. Grace renewable energy carry out the entire operation by following the strict quality controlled processes following evaluation of the capacity required. The designed range of solar panels for electricity for us is of the highest quality and is known for its reliability, durability, potent to harvest the maximum amount of the electricity from the solar panels in India.